Sorry, that Maroon 5 music video is fake. A few folks have been sending me this latest music video by Maroon 5, in which the band claims to spend a Saturday in Los Angeles crashing multiple wedding receptions and surprising newlyweds with an impromptu performance. One of the couples is an Asian American bride and groom. It's cute. It's also all lies. Apologies to all who really enjoyed the OMG-there-are-rock-stars-at-my-wedding spirit of it all, but the whole thing was apparently staged. The deception started to unravel when folks began recognizing a handful of people in the video as actors (including a former America's Next Top Model contestant) and perhaps not totally random, regular ol' wedding revelers caught in a candid moment. 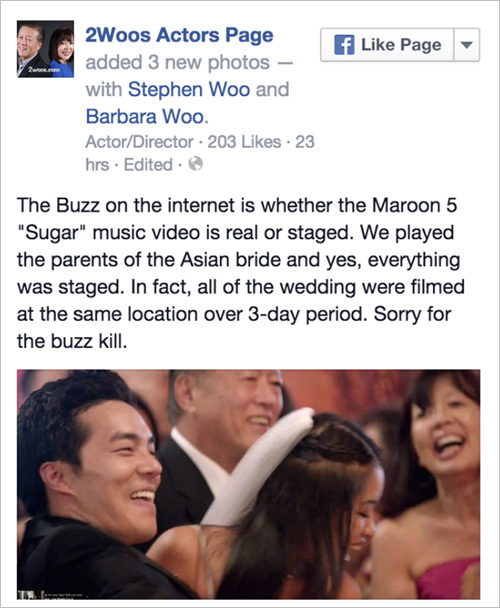 In the case of the Asian American wedding, the actors who were cast as "parents of the Asian bride" -- real-life couple Stephen and Barbara Woo -- let the cat out of the bag on their Facebook page, confirming that everything was indeed staged (and no doubt, bursting a few bubbles). When it became apparent that the revelation had dropped a bigger bombshell than they'd intended, Mr. and Mrs. Woo edited their Facebook post, clarifying that their statement was for "educational purposes only" -- not fodder for those digging up dirt. They also insist the lack of real-ness shouldn't get in the way of your enjoyment of the video. Post by 2Woos Actors Page. Turns out some delightful, surprising moments in a music video was faked. Surprise! Come on, not really.